Register for Using Attendance Data for Decision-Making: Strategies for State and Local Education Agencies. When students miss school, they fall behind their peers academically, which can have lasting effects throughout their education and hurt their chance to graduate. 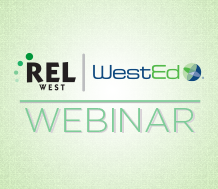 This REL West webinar will address the importance of accurately tracking student attendance data and how those data can be used to make policy and practice decisions that will help chronically absent students get back on track. Concrete examples of how state and local education agencies can work within and across their departments and communities to address chronic absence will be provided. In addition, participants will have an opportunity to engage in a group discussion and question-and-answer session with the presenters.